The Bend Motorsport Park is targeting up to five major events for its maiden season next year as talks to lure international series to the venue continue. 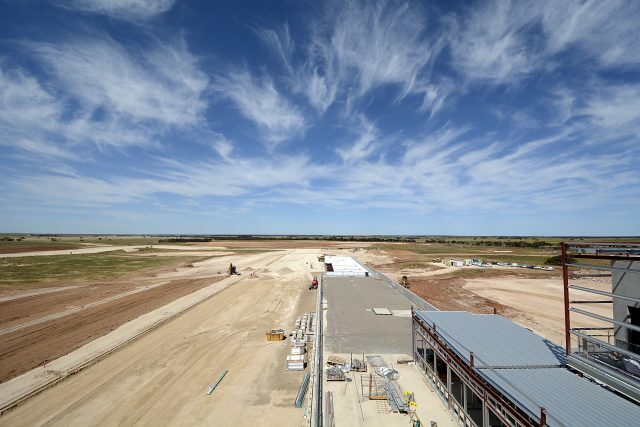 Australia’s newest permanent racing circuit is three months away from hosting its first event at the state-of-the-art $110 million 7.7km track. While construction of the facility, located at Tailem Bend, South Australia, continues, the first piece of the 2018 event calendar was confirmed earlier this month, with Supercars set to host a Super Sprint round from August 24-26. The FIA Grade 2 and FIM accredited circuit, funded by the Peregrine Corporation, is working to populate its calendar with talks well underway with national and international series. The venue remains tight-lipped regarding the identity of the national and international championships it is talking to, but has confirmed it has contracts that are awaiting sign off. Circuit general manager of operations, John Clark, is excited by the prospect of the track’s first season that could include five major events. “We have got some very exciting world class activities looking at coming to the venue.” Clark told Speedcafe.com. “We have got a lot of different stuff lined up. “The circuit is working on some big projects at the moment and we will disclose as and when the contracts are signed. “We want to have some bespoke events and we will be looking at four or five in our first year if we can. Meanwhile, the next crucial stage of the build is set to begin when bitumen is laid on the 7.77km circuit later this month. Cars are not expected to circulate until March with the circuit to open with a 24 hour cycling event from January 13-14. In preparation for its first year, the circuit’s operations team has recently undertaken a fact-finding mission to Europe and the Middle East to learn how some of the world’s best motorsport venues function. Representatives travelled to the Yas Marina circuit, host of the Abu Dhabi Formula 1 Grand Prix, and the Dubai Autodrome to learn how the tracks operate major events alongside the day-to-day running of the business. This was followed by a trip to England to the renowned PalmerSport driving experience at Bedford Autodrome, run by ex-Formula 1 driver Jonathan Palmer. Clark says the trip was hugely valuable for the circuit as it prepares for its first season which will coincide with plans to establish a world class driving experience program. “It is vitally important to gather as much information as you can,” added Clark. “If you are going to build the best then you need to see what is out there and try and understand it as best as you can. “Getting on the ground and talking to people and seeing the way things operate for running big events is important. “The (staff at Yas Marina) were very accommodating and they showed us race control and all the infrastructure behind the scenes and marketing strategies. “We are also looking at something similar to PalmerSport so we can attract people from all over the world to come and drive an Aussie type of event. The circuit is currently looking to expand its operational staff to a team of 45 people.